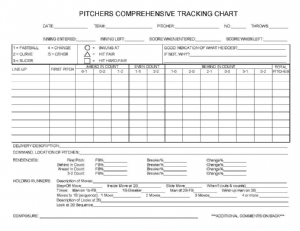 Individual Pitcher's Comprehensive Tracking Chart - Introduced at the request of coaches looking for a more complete tool to track each pitchers' performance during the game . The Individual Pitcher's Chart is a full 8.5 inches by 11 inches. It is produced on heavy stock paper similar to our dugout charts for ease of writing. 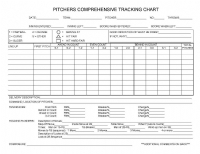 The Individual Pitcher's Comprehensive Tracking Chart comes pre-packaged for 50 games.